No longer available. Check back later for new models. "We consider these projectors to be a triumph in the advancement of the art and science of electronic imaging." 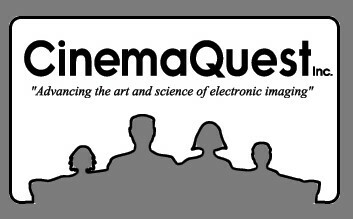 - CinemaQuest, Inc.
"The 'Baraka' Blu-ray with its 65mm source and 8K UltraDigital HD restoration process was intended to be a benchmark for the burgeoning Blu-ray industry. I needed a 1080p reference display that would allow me to do the critical quality assurance of the Blu-ray encoding and authoring. Pixel discrete flat screen monitors in the 42-55" were the first step, but I needed something bigger, but with reference quality. The Samsung SP-A800B, with its 100" diagonal picture gave me that next step up for our target high-end Home Theater market. The SP-A800B provided me with accurate color, deep blacks, superb sharpness, and surprising brightness uniformity. This projector gave me the best pixel for pixel reference for detecting artifacts in the image processing of 'Baraka.' This tool allowed me to push the delivered quality of the 'Baraka' Blu-ray to it's highest potential." "Part emboldened and part simply curious Kline produced a high-def disc of clips from 10 Criterion films to see what they'd look like on Blu-ray. He showed it to me in the company's custom-built screening room, which sports a Samsung SP-A800B projector, designed in conjunction with HD video pioneer Joe Kane, and a 10-foot-wide screen. (Klien and his crew scour trade shows for the best equipment. They do much of their quality-control work on Sony's BVM professional-grade CRTs.)" 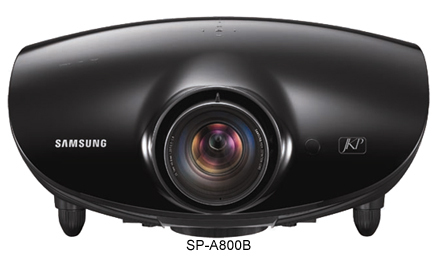 Fred Kaplan - 'Home Theater' Magazine: "A New Criterion For Blu-ray- The movie lover's label moves into the next gen."
Samsung SP-A800B: *Reduced Pricing* Please contact us for more information. Samsung SP-A900B: *Reduced Pricing* Please contact us for more information.